Davis suggests that the county should consider a 50/50 ratio rather than the current 25 percent alcohol and 75 percent food ratio. A change of the magnitude suggested by Davis would be dramatic, as none of the county’s eight restaurants reporting sales figures for 2014 listed more than 24 percent alcohol sales, and the average among them was only 10.8 percent. 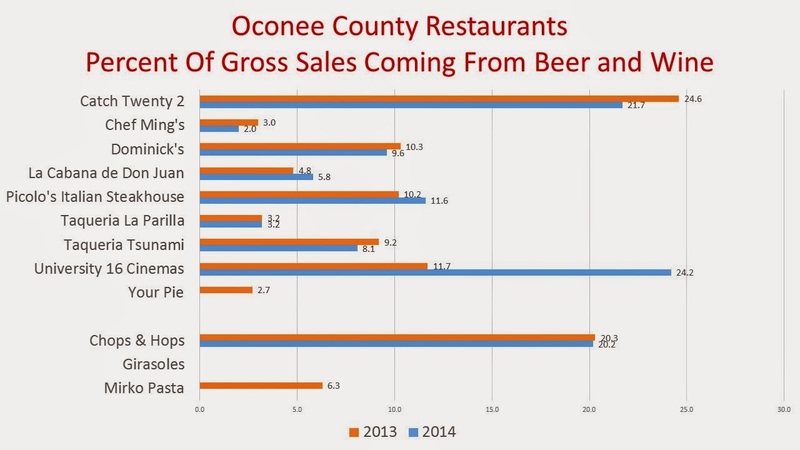 The sole Watkinsville restaurant that reported its alcohol ratio in 2014 had only 20.2 percent of its revenue from alcohol sales. Davis’ column, which appeared on page A7 of the paper last week, also is on the county web site, under the heading County Talk By Chairman Melvin Davis. Each week Davis poses a question to himself and then provides the answer. Davis begins his answer by lavishly praising Cheddar’s, which opened in Epps Bridge Centre on Feb. 2 and is co-owned by Allen Peake, Macon representative to the Georgia House and Republican Party Caucus secretary and treasurer. “Citizens indicate the food is good, service is great and the price is very reasonable,” Davis writes. Davis then answered his question about new chains. “Some question the ratio of alcohol-to-food sales that is required,” he continued. The county only began asking applicants for its beer and wine licenses last year to report their sales ratios, so data only exist for 2013 and 2014. The data for 2013 were reported by quarter, rather than for the full year. All applicants for 2014 licenses had to indicate their sales ratio for all of last year. In the chart below, the data for 2013 are for the final quarter of the year, except in the case of Taqueria Tsunami, for which the first quarter of 2014 is shown. The restaurant was not open in 2013. Only two restaurants, Catch Twenty 2 and University 16 Cinemas, come close to the 25 percent alcohol ratio. Your Pie changed hands, so the current license holder could not report data for 2014. Of course, the addition of alcoholic drinks to the menu may put added pressure on the ratio. The county has already granted a license to sell alcoholic drinks to Cheddar’s, Dominick’s, La Cabana de Don Juan, Taqueria La Parrilla, and Taqueria Tsuname. The liquor-by-the-drink ordinance passed by the county does not apply to restaurants in Watkinsville. Voters in that city will be asked to approve an ordinance allowing the sale of liquor in its restaurants in March. The city’s three restaurants with beer and wine licenses also are required to report the ratio of beer and wine sales to food sales, but only one of the three did so last year. Despite that, the City Council approved renewal of the licenses for all three of the restaurants. Girasoles has never reported its sales ratios, according to records I have been able to find in the city clerk’s office for the last five years. And Mirko’s has reported its ratio only once. There is a tavern in the town, in the town and there our Melvin sits them down, sits them down, And sells his liquor as merry as can be, And never, never thinks of Oconee. "Each week Davis poses a question to himself and then provides the answer." I wonder what all of the pastors in the county think about Melvin's incessant push for alcohol sales in Oconee.